It cooled off a bit yesterday! I mean, like, I was in the car and the outside temperate read 27 C, so I thought to myself – wow! YAY! So much cooler! And then I thought – well, actually, that’s still kinda hot. But better than yesterday when it was reading 35 C in the car. Why am I saying this? Because it means that the house it a little cooler. Which means… tadah – I can use the oven! Oh YAY! Not for long, you understand, so no making homemade Turkey Jerky or anything, but I can use it for a short time to make some snacks for during the week. As I had some mince meat in the fridge, and some cherry tomatoes and feta… I came to the conclusion that something ‘greek-like’ was in order. Preheat oven to 210 c (which is about 425 F). Stick the onion, black olives and garlic in the food processor and whizz them ’round to chop. Add in your herbs, salt and pepper and eggs. Pour all this into a big bowl and mix it up with the minced meat until well combined. This is where things get fiddly. Cut your cherry tomatoes in half and scrap out using your thumb or finger nails the inside bit. Don’t waste that bit – just stick the seeds and insides in with the minced meat filling. Cut the feta into tiny pieces and stick an itty bitty block inside each cherry tomato half. Spoon (or scoop with your hands – whatever!) 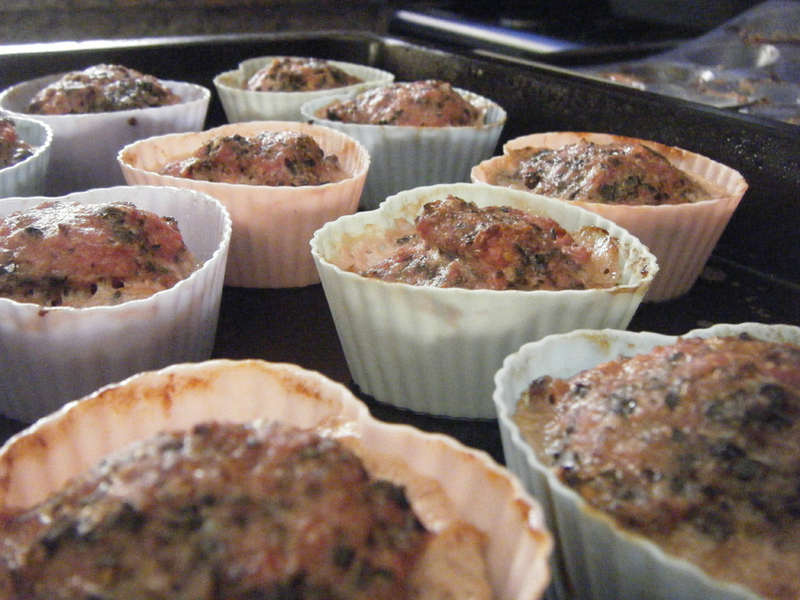 the meat mixture into silicone muffin cups. Now, I had these small (probably for little biscuits or chocolates) ones and some heart shaped ones, I used both. The small ones I scooped the meat into and then pressed the cherry tomato halves on top. In the heart shaped ones, which were bigger, I put the cherry tomato halves in halfway and then covered them with meat. Cook for about half an hour in the oven. Your time might vary – my oven is a bit… unpredictable. These actually taste even nicer once they’ve cooled. So good to keep in the fridge for snacking on!